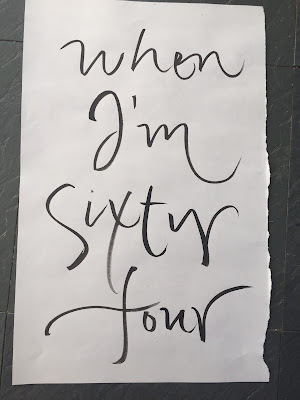 Being 64 seems particularly significant as that was the number that signified old age when I was young—when you would worry if someone would still love you, when you would retire to a cottage in the Isle of Wight if it's not too dear. My birthday is always when I evaluate my life and make my resolutions rather than the new year. I've been doing a lot of thinking over these past few weeks and I look forward to sharing my goals for my teaching and my work and especially my attitude over the next weeks for Studio Sunday. Well, happy birthday then! I'm not far behind you. I suppose I do an assessment myself on my birthday, particularly as I've entered this time of AARP nagging & social security/Medicare decisions looming. However I can't shake the artificial divisions of the calendar and the feeling of fresh start turning to a blank calendar on January first brings. Birthdays have a different feel somehow, time getting away rather than opportunities awaiting. Well - guess it doesn't hurt to have two "where am I going" life checks in a year! This perspective you've presented has given me something to think about. Looking forward to hearing what you have decided upon.